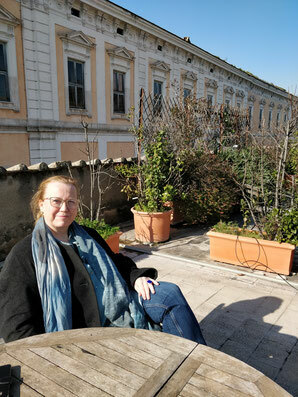 The Norwegian playwright, novelist and theatre director Lene Therese Teigen is back at Circolo Scandinavo after a break of just under a year. Last time Teigen was here she was doing research for her project about Livia, the wife of the Roman emperor Augustus. Livia's room, which is also the name of the project, was primarily located in Livia's villa in Prima Porta, and is now, completely preserved, exhibited at Palazzo Massimo. Staying at Circolo last year was of particular gain to Teigen, since her then fellow artists Ingrid Aarset and Thuridur Jonsdottir became interested in the project about Livia's room. They collaborate on the project which this month will result in a work-in-progress performance at Circolo Scandinavo and the conference "Livia's room in context" in collaboration with the Norwegian Institute. Various Nordic academics and artists are participating. From last year's stay Teigen remembers the friendly atmosphere with good talks with good people in a then sunny and beautiful January-Rome. The group did excursions together and for example when they went to Prima Porta, all the artists of January came along. This time Circolo already feels like a home in Rome, leaving less time to rush to see different things and more time to relax. Although the project does keep her quite busy! It's a privilege to be able to come back to Circolo, Teigen says. The best thing with Rome is the obvious existence of different historical periods, to be able to walk where Livia walked is an amazing feeling. At the same time it's a busy contemporary city where the renaissance is very visible. Not surprisingly her favourite place in Rome is Livia's room in Palazzo Massimo. Teigen also enjoys the San Lorenzo area close to Sapienza university because it has a different vibe. Other tips are Terme de Caracalla, the Capitolini museum, the view from Gianicolo hill and a rare spot on top of Aventine hill where you can see the St. Peter's dome through a small hole in the wall, just follow the line of people queueing! Teigen thinks Rome has a specific character she likes and points out that the city always has been frequented by travelers and tourists, something that makes it easier to blend in. She will, however, not trust the public transport, but prefers to walk or take a taxi. If visiting her hometown Oslo, Teigen invites you to her house close to the forest, go cross-country skiing or walk on the roof of the opera. The city has a lot of interesting areas, so be sure to not only visit the centre.